Yes, you should have worked out last night instead of going out for drinks with the girls. No, it wasn’t mandatory to order your own death-by-chocolate instead of sharing. And maybe, super-sizing your fries at the drive-through wasn’t the best idea for your thighs. Although you and only you are center stage when it comes to sensible eating and exercise, not all fat is your fault. Even die-hard dieters and exercise addicts get cellulite, those not-so-cute dimples on the thighs, hips and buttocks. While poor diet and lifestyle choices can accelerate its formation, a large part of cellulite is composed of fat and toxins that get trapped in the subcutaneous layers of the skin. Cellulite rarely discriminates: 90% of all women will get it at some point. So what's a girl in search of a rock-star body to do? The never-ending search for an answer has produced more curiosities than cures, with experts divided as to what works best -- an internal or an external approach. 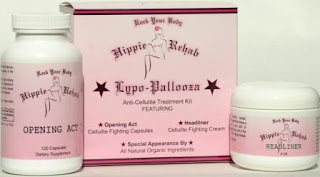 But one new non-invasive treatment, Lypo-Pallooza from Hippie Rehab, fights cellulite from the inside out and the outside in with two synergistic steps. This cellulite treatment kit, the only all natural, two-step system on the market, targets cellulite in a groundbreaking new way, by helping to flush excess trapped fluids and toxins from the body, and strengthening and toning the skin at the same time. First on the lineup is Opening Act, all-natural cleansing capsules that will jump start the process of flushing out harmful toxins and excess fluids, and strengthening the muscle tissues. The capsules, taken twice daily, contain only botanical ingredients, including some of the most powerful circulation, metabolism, and digestion boosters found in nature. These herbs and extracts include grape seed, bladderwrack, soy lecithin, sweet clover, gingko biloba, kelp and gotu kola, among others. Women have noted with regular use a visible reduction in the appearance of cellulite, as well as improved energy and simply feeling lighter and slimmer. The second "act" is Headliner, an all-natural, organic cellulite treatment cream that works to give the skin a more toned and tightened look. The cream is applied twice or more daily to cellulite areas. It contains a bumper crop of botanicals known for their skin smoothing, toning, and collagen-strengthening properties, as well as for their ability to improve circulation and moisturize. These include caffeine, comfrey root, algae extract, dandelion and horsetail extracts, and much more. Lypo-Pallooza is the brainchild of Ohio entrepreneur Stacey Sparks. Sparks’ upbringing as the daughter of an inventor, her background in aesthetics and her personal quest to find an effective, non-invasive, non-chemical solution to cellulite all converge in this unique, holistic approach. "Why not use the best, natural cellulite-fighting ingredients available to address the problem from two different angles, not just one?" she muses. And Sparks also wanted to distinguish her product from traditional cellulite treatments by giving it a fun and upbeat attitude and package, inspired by her life-long love of rock music and concerts. "Hippie Rehab is the place to be for everyone who wants to rock a bikini this summer," laughs Sparks. Although Sparks recommends that the two components of Lypo-Pallooza (Opening Act and Headliner) be used in concert for the best and fastest results, (most women report seeing a difference in four to six weeks), they can be purchased separately. MSRP for the Lypo-Pallooza kit (a 30 day supply) is $79.99. Opening Act (120 capsules) is $39.99, and Headliner is $45.99, when purchased separately. I've had three kids and I don't work out regularly, so you can bet I have cellulite. Although I just started using this kit, I can see a tiny bit of difference, and I hope it works within a month! Just seeing the Celebs that Lypo-Pallooza has helped, makes me more secure that it will! One lucky reader will win of the kits pictured above, containing both of the products outlined in this review. Please fill out the form to enter. Anyone who makes a purchase at Hippie Rehab, can use this code: PROMO to receive $20 off of their order! Click HERE to start shopping! Don't forget to stop by Moody Mama Says and Everyday Baby Steps and enter their giveaways for extra entries!